Red Leaf tea’s new special flavor, the Sicilian Vespers, is a perfect delicacy. The essence of the delicate tea is the ability of the straight flavor of the leaf to remain clear and present on the palate, as you measure the brew for heat, spiciness, aftertaste and other factors. The floral taste of osmanthus and chrysanthemum are not overwhelming, but in the measured balance of this tea they stand out beautifully, and, need we add, delicately, against the cabernet wine infusion folded in for sweetness. This is an outstanding and delicious tea, perfect for afternoons or mornings! This tea took a little while to grow on me, but once it did – I really fell in love with it! The first couple of times I tasted it, I thought it was alright. But now, as I’m finishing the last of what I have of it, I am realizing just how good it really is! Funny how that works out sometimes! The flavor is crisp and sweet – but not too sweet. Some of that sweetness is cut with the slightly tannic nature of the cabernet wine, giving it a whisper of astringency. But it’s the floral essence that really gives this tea blend its extraordinary flavor. It is a delicate floral taste – but it is just enough to provide an interesting contrast to the flavor of the wine and white tea. 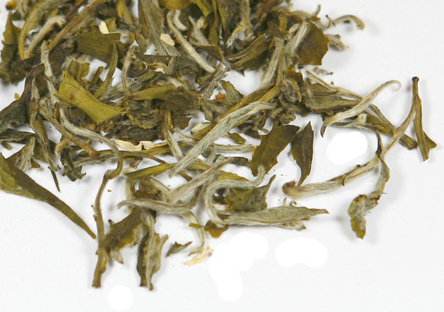 The white tea base is soft and fresh. The lighter body of the white tea is just right for this blend, anything heavier would upset the very pleasing balance in this cup. This tea is very good served hot, and even though it is rather delicate in flavor, it manages to retain its flavor nicely as it chills, making this an excellent iced tea as well. This may very well be one of the best wine-infused teas that I’ve tasted thus far! If you’ve been curious to try a wine-infused tea, I suggest starting with this one!